Round grandma. Chelsea’s Pizza Italia is changing the shape of the grandma slice in the most delicious way! The name was initially coined by Angelo Giangrande at Umberto’s in New Hyde Park when he created a pie similar to the pizza his grandmother made by pushing the dough into a cookie sheet, adding loads of herb-infused red sauce, and layering on mozzarella cheese, olive oil and anything else that may have been in her kitchen. The result was a flavorful slice and the beginning of a whole new style thicker than typical pizza but thinner than Sicilian. But it was definitely in the shape of a square. 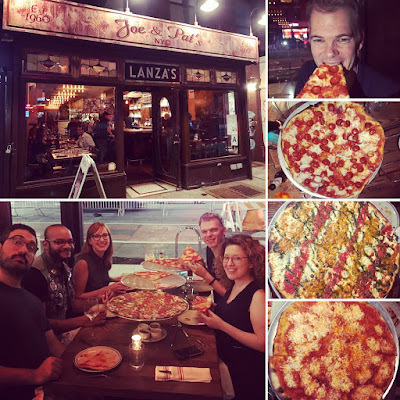 Pizza Italia has changed that by applying grandma ingredients on a slightly thicker round dough then slicing it in the same manner of a New York Street slice. Since they are the self-proclaimed “home of the triangle grandma slice,” order it! Don’t be distracted by the gazillion elementary school kids that bum-rush the cozy pizzeria just before noon to scarf down the sweet sauced plain cheese slices. You’re an adult so hold out for a fresh signature grandma pie to come out of the oven and enjoy the savory sauced, melted mozzarella slice. You’ll be glad you did. 1. Cory Przybilla is on my softball team Down To Field in the Williamsburg Fall Softball League. He's a great ballplayer! He's also funny. I told him he should try the free improv comedy class at the Magnet Theater. 2. James Roberts is a hilarious improviser who travels the world and works in the same building as Cory. I hope they end up good buds. The quality of the pizza could be influenced by the guest. I have had slices with James Roberts in the past and they were some of the tastiest of my life!